The season for retro must be in full swing, because that famous gang of tree-living rodents is back once again! Check out their new DVD now! 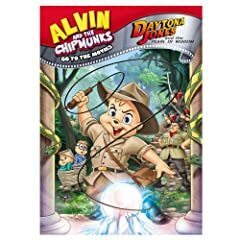 Starting this September 9th, now available on DVD from Bagdasarian Productions and Paramount Home Entertainment comes the next group of hilarious movie send-ups done Chipmunk style. Alvin And The Chipmunks Go To The Movies â€“ Daytona Jones And The Pearl Of Wisdom is ready to burst out of your television and take you on three stories of adventure and mischief. Bring home this hilarious DVD today! This film spoofs three of our most beloved action stars in hilarious Chipmunk fashion. The first episode in this film is about the title character, Daytona Jones. He is off to find the Pearl of Wisdom in the Exotic East. But, as you could have guessed, someone is out to stop him and use the power of the Pearl for evil. Can Daytona make everything right again? Next comes the story of Batmunk who must fight Jokester for the soul of his city. The nod to this summerâ€™s hit is obvious. Finally, this DVD wraps up with the story of Robomunk, a robotic police officer who patrols the city with his human partner. They must defeat Mr. Pinky and save the city. There are no special features included on this DVD. The three episodes included in this DVD are very entertaining. The spoofs are multi-layered and filled with obscure nods to the deep mythology behind each of the popular science fiction and comic book stoked stories. I enjoyed each of the stories, with the Indiana Jones story being the most complete and compelling. I wholly recommend this movie as it is a welcome trip back with Alvin and a company and a refreshing look at some of our favorite movies. Take a fresh look at the Movies with this DVD. No user commented in " Movie Review: Alvin And The Chipmunks Go To The Movies â€“ Daytona Jones And The Pearl Of Wisdom "